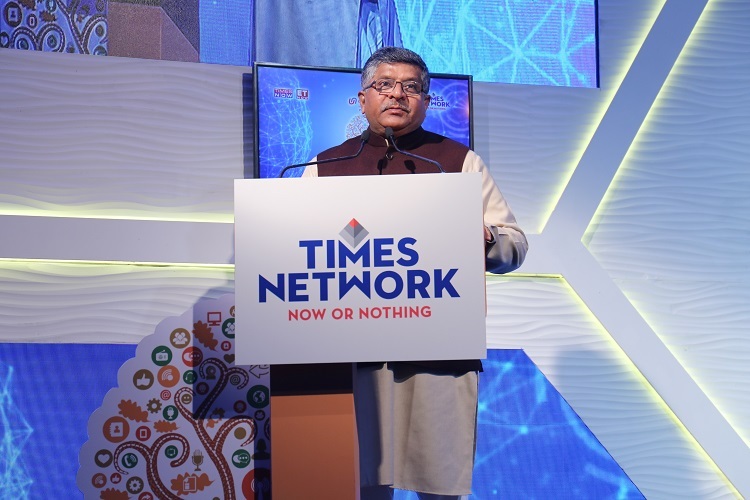 TIMES NETWORK, a part of India’s largest media conglomerate, The Times Group, launched the fourth edition of its ‘Times Network Digital India Summit and Awards 4.0’ today. Attended by some of the most valued dignitaries in India, the summit aimed at deliberating on key challenges and laid out key imperatives and framework for turning the vision of ‘Digital India’ into a reality, through a series of panel discussions and deliberations. The summit kicked off with the keynote address by the Chief Guest, Honorable Union Minister for Law & Justice and Electronics & Information Technology, Shri Ravi Shankar Prasad. The participants at the first session of the panel discussion themed “Digital India- Where Do Things Stand? A Real Time Assessment” were Ms. Aruna Sundararajan, Secretary, DoT; Ms. Debjani Ghosh, President Designate, Nasscom; Mr. Rajkiran Rai, MD & CEO, Union Bank of India; Mr. Sri Rajan, Chairman, Bain & Co India and Mr. Karan Bajwa, MD IBM India. The summit had discussions on the relevance of 5G in India, how Fintech has helped in the growth of Digital India and discussed the importance of data security in India. The session extensively talked about the opportunities and challenges in the digital world when the country is looking for economic independence. TIMES NETWORK is part of India’s largest media conglomerate, The Times Group. It houses upscale brands including; TIMES NOW – India’s No. 1 English News channel, ET NOW – India’s No. 1 Stocks and Business News channel; Mirror NOW – second English General News Channel; MOVIES NOW and MOVIES NOW HD – India’s leading English Movies channel; MN+ – The Gold class of Hollywood; Romedy NOW and Romedy NOW HD – a unique destination for Love and Laughter; Zoom – India’s No. 1 Bollywood channel and the latest adtidition to the English Entertainment Cluster is MOVIES NOW 2 and MOVIES NOW 2 HD – The new age Hollywood channel for Young India. The network delivers segmented and differentiated content under one umbrella. It informs, entertains and engages over 100 million urban affluent viewers in India and is available in over 100 countries across the globe.